"I am going back to Detriot for some old-fashioned American street violence." Set several years after the events in the first Beverly Hills Cop film, Beverly Hills Cop II once again finds Detroit police officer Axel Foley (Murphy) away from home trying to bust a large crime sect. What brings Axel west this time is the shooting of his friend (and former enemy) Lieutenant Bogomil (Cox) at the hands of what the Beverly Hills police are calling "The Alphabet Killer". Soon Axel is reunited with Detective Billy Rosewood (Reinhold) and Sergeant John Taggart (Ashton) as the three set off to uncover the identity of this killer. 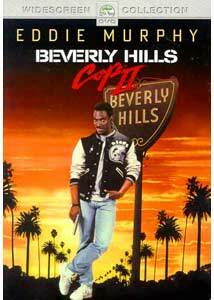 The original Beverly Hills Cop is considered by some (including myself) to be a classic of 1980s cinema. It is a fresh, witty and thrilling action-comedy that cemented the star status of Eddie Murphy and breathed new life into the genre. Then came the obligatory sequel, and while the addition of director Tony Scott helped ensure that the action would be done in a much more stylish manner, upon the film's release, it was easy to see that there was undeniably something missing. That something may well have been any sort of originality. Screenwriters Larry Ferguson and Warren Skaaren (working from a story by Murphy) have seemingly done nothing more that take moments that worked in the first film and incorporate them into a plot so confusing that the audience can barely decipher it. We see Axel mess up in Detroit, come to Beverly Hills and embarrass the high dollar crowd, all the while solving a case that the Beverly Hills police department seems lost in handling. This worked well in the first installment, and nearly every set piece in this sequel can be directly related to its predecessor. Throughout the Beverly Hills Cop, trilogy the weight of the films has always squarely rested on the shoulders of Eddie Murphy. While he was abundantly enjoyable in the first installment, here he seems, at times, over-the-top in his antics, though he obtains several laughs throughout the film. The best portion of the cast can be found in the supporting roles. Reinhold and Ashton get more time in the sequel, and Reinhold especially comes into his own with a more defined character. Yet above all, I found myself enjoying Beverly Hills Cop II—for the most part. The villains are especially well cast, with Jurgen Prochnow doing what he has done so well over his career; we don't know much about his character, but his performance is very well done. Director Tony Scott creates a fast-paced film with several intriguing action sequences, while the cinematography by Jeffrey Kimball is almost masterful in its composition. This is a movie that is loud, fun, and full to the brim with style, if only it had a brain in its head. Image Transfer Review: Paramount presents Beverly Hills Cop II in an anamorphic 2.35:1 widescreen transfer that is very well done despite some small problems. Since the film was shot in Super 35, it should come as no surprise that there is some grain present; though a comparison between my laserdisc of the film and this new DVD showed vast improvement with this anamorphic print. Edge enhancement is at times problematic with several scenes showing noticeable examples. Overall this is nicely done and helps to show off Tony Scott's visual style. Audio Transfer Review: With a newly created Dolby Digital 5.1 sound mix I had high hopes for Beverly Hills Cop II, as it is, without a doubt, the most action-oriented of the trilogy. The mix did not let me down. The score comes through cleanly in the surround speakers and front channels, while ambient effects can be heard from time to time in the rear speakers. The split surrounds are never showcased as much as I had hoped for, especially in the climactic sequences, but when the action occurs on screen the speakers do show some promise. A Dolby Surround track is also offered, though this seems to be exactly the same as the mix used for the laserdisc several years ago. There is a slight difference between the two mixes, the main one being the more defined score in the 5.1 mix. Extras Review: As with the other Beverly Hills Cop releases from Paramount, II hosts a nice selection of extra features. The most notable is a new collection of interviews with Judge Reinhold, Tony Scott, Jerry Bruckheimer, John Ashton, Ronny Cox and others, talking about the sequel, as well as the pre-production ordeals the picture faced. The interviews are informative, especially as Scott and Cox talk about the original idea of setting the film in London, while the other clips prove to be an abundance of praise for Tony Scott and Eddie Murphy. An extension of the gun club break-in sequence is presented, with an opening by director Tony Scott, who talks about exactly why it was cut. The original featurette runs a short seven minutes and should be applauded, as it gets Hugh Hefner's thoughts on the film, which we all know is important, because he has so much screen time in the film (! ).The Shakedown Music Featurette is a short clip that looks at the creation of the song Shakedown and the artists involved. The final extra is the original theatrical trailer, presented in 1.85:1 anamorphic widescreen and is nicely done. Beverly Hills Cop II is a film divided into different parts. The direction by Scott and the performances are each worthy of recommendation, but the poor script hampers the quality of the whole. The video and audio portions of this DVD are presented very well and some nice but ultimately empty extra features make for a well-rounded disc. Recommended if you are looking to complete the trilogy, but as a stand-alone purchase, pick up the first film instead.